On more than one occasion, I’ve been told I can be intense at work. Not the “I’m a teepee, I’m a wigwam, I’m a teepee, I’m a wigwam” intense, but the “get out of his way when he’s coming down the hall” intense. Whether it is my “game-day” face, the New Yorker in me or “get it done” mentality, I wouldn’t necessarily say I’m being intense. I would say, I’m controlling the controllables. So, what does that really mean? Well, one of the aspects of public relations and media relations that I enjoy the most is the art form (yes, I believe it to be an art form) of creating the news and seeing/hearing it online, on the radio, television, print. For me the fun is in as much the journey as it is in the end result. It’s great to see/hear the reporter encounter the “Oprah Ah-hah Moment” and reap the rewards of that third-party credibility. After all, in so many ways, that is the name of the game – – third-party credibility. It is one thing to have me tell you how compelling/important/awesome something is, but it is so much better else to have Robin Roberts, Katie Couric, your favorite reporter/columnist, the morning radio host, etc., say so. However, one of the inherit challenges that goes along with this, is a little thing I like to refer to as Breaking News. We all have tales of our stories being bumped, preempted, postponed because of breaking news. Our stories, events, news conferences, etc. compete with the real word and sometimes, the real word happens. And try as we may, the real world isn’t controllable. Therefore it is incumbent on us to control the controllables. Below are some thought on how to do so. For the sake of this discussion, I’ve included thoughts when dealing with an event, news conference or story. Be vigilant – If you are planning a media event or news conference, the real work starts days/weeks/months before the event. Is it the right story? Is an event or news conference the best way of getting your message across? How accessible is the event/conference to the media? What type of media are we targeting? Don’t rely on lists. Have actual one-on-one interaction with the media. Can materials be developed in case the media get called away day of the event? Spelling counts in whatever we do as does Associated Press style. Ask questions of the media – Our work doesn’t end when the media say yes to our pitch. The more information we can get the better. Participate in the process of developing the story. How is the client plug going to be included? Is this going to be a roundup story or a feature? Interviewing other people? Will a reporter be attending the event or a camera person alone? Update your client/manage their expectations – It is one thing for us to know that Breaking News happens. It’s another to make sure our clients understand it too. The more relevant information you can provide, the better. Never say never – Now, just because breaking news bumps your story, it doesn’t necessarily mean you are finished. Consider producing your own b-roll of your event. Can a photo be used online? Can you do the interview a different time? Can you blog about your story? Post video or pictures on your company Facebook Page and Twitter Feed? So, when was this slow, not shall I say “cut” man (that would be me) confused for Olympic Gold Medalist, Michael Johnson? And how does it relate to controlling the controllables? 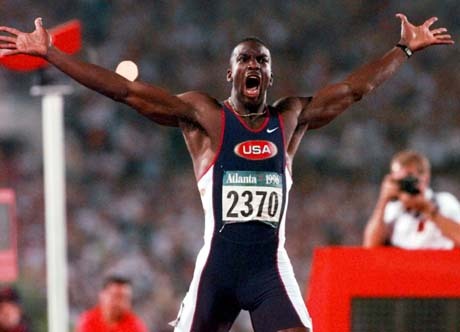 Prior to the Sydney Olympics, my client at the time was hosting a press event in Atlanta with spokesman, Michael Johnson. We had area kids at the press conference and Michael was going to introduce my client’s program that would feature Olympic hopefuls. We had worked long and hard on the event. Two junior staff members (who I’m very proud/happy to say are now anything but junior; both are well-respected and quite successful) and I had spent the better part of a month developing the logistics behind the conference and worked the phones in making sure the media were well aware of the details. As “luck” would have it, disgraced Major Leaguer, John Rocker, chose the same time as our event to call a news conference to discuss some “controversial” comments he had made. I received the call in the car service from my teammates who told me the news. I could hear from their voice that they were not only disappointed but a bit apprehensive as to what my reaction would be – – in retrospect, I guess I had my “game day” face on for a couple of weeks. I believe – much to their surprise – I was calm. I knew we had controlled everything we could, and both the client and Michael were well-briefed on what we had done to prepare. The news conference ended up going well and we had good media coverage (I guess Rocker really didn’t have all that much to say). As I was wrangling the press and letting Michael speak with different reporters, one woman came up to me with her son and asked me for an autograph. I looked curiously at her and asked why she would want an autograph from me. “You are Michael Johnson,” she asked. No ma’am. The athletic looking gentleman in the Olympic sweat shirt, flanked with all sorts of media, THAT would be Michael Johnson. Me, I’m just a PR guy who, like James Cagney, is a song and dance man (even though I can’t sing or dance) at heart. Andy – I’m enjoying your blog posts and insights – thanks for taking the time! I fondly remember working with you on national media campaigns. I knew all I had to do was pick your brain, follow your direction and success would follow. And for the last decade since we worked together, I’ve been able to continue generating great results for my clients thanks in part to the many great lessons I learned from you. Keep the posts coming!